Leigh Griffiths insists changing the manager is not the answer to Scotland’s problems. Gordon Strachan is under increasing pressure following the 3-0 defeat by England at Wembley on Friday night, which dealt a major if not fatal blow to the Scots’ 2018 World Cup qualification prospects. The visitors started full of promise but striker Daniel Sturridge’s header after 24 minutes established the home side’s lead and Adam Lallana and Gary Cahill added further headed goals after the interval. 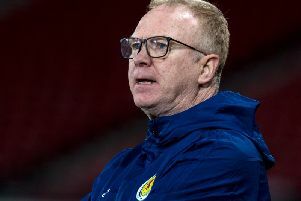 The Scots dropped to fifth place in Group F with four points from four games, sitting above only Malta, and the post-mortem which followed the defeat by the same scoreline in Slovakia last month resumed long before the final whistle sounded in London. It is understood that the Scottish Football Association appreciate that four points from 12 is a major disappointment and are aware of the prevailing mood but the best route forward, and the way in which impetus will be regained, will tax the governing body and Strachan himself. However, Griffiths, one of eight changes made to the side which started in Slovakia, is behind the boss . “Obviously it is a results-based business but changing a manager midway through a campaign is not the answer,” said the Celtic striker. “As players, we need to focus on the next qualifier. “The manager told us to keep our heads up. We are bitterly disappointed but we go away and when we meet up in March for the next qualifier, we need to be ready. Midfielder James Morrison, another surprise starter, claimed Scotland paid dearly for the loss of “silly goals at crucial times” but insists Strachan is still the man for the job. “I think we all really appreciate Gordon. He is a man full of knowledge. “There are lots of positives. I think when the third went in that’s when they dominated but if we take our chances it is a different game. Despite the damaging result at Wembley, Griffiths insists the players are “still upbeat” ahead of the visit of Slovenia next March. The former Hibs player said: “We need to go into the home games still with great confidence, we need to make the home games count. Griffiths got the start he wanted, preferred to Chris Martin and Steven Fletcher. However, in a first-half break he squandered a golden opportunity to play in Robert Snodgrass, opting to shoot to incur the wrath of his team-mate. “I am in the middle of the goal and I heard him shouting. “I thought the midfielder tracked him and I just thought to have a shot but it is one of those things.